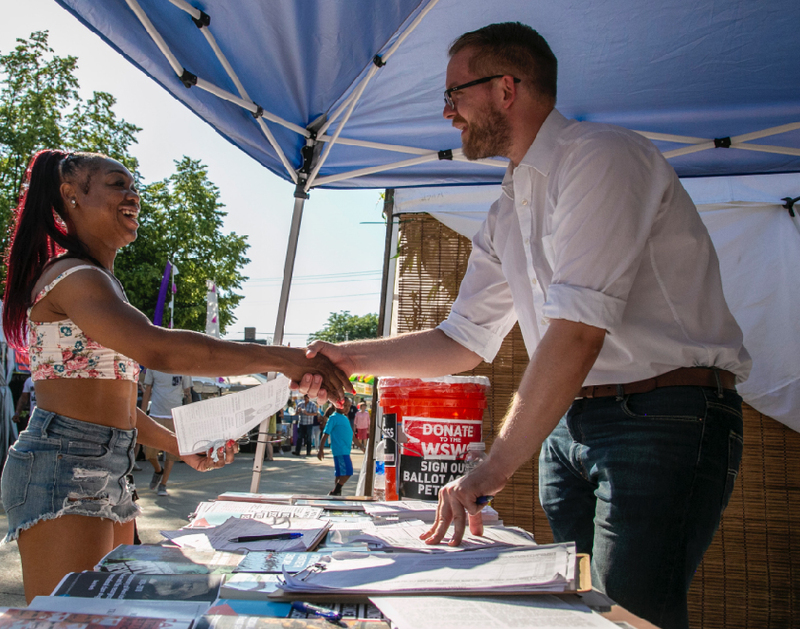 The Socialist Equality Party has selected Niles Niemuth as its candidate for Michigan’s 12th congressional district in the 2018 midterm elections on November 6. Niles will run on a socialist, anti-war and anti-capitalist program in the interests of the working class in Michigan and around the world. As the SEP’s candidate, Niles will fight to unite all workers in opposition to the Democratic and Republican parties, both of which represent the interests of a small layer of the corporate and financial elite. Niles, 30, was raised in a working-class family in Wisconsin and became a member of the SEP during the 2011 mass protests against budget cuts imposed by Wisconsin Governor Scott Walker. He was the SEP’s candidate for vice president in the 2016 elections. Niles has lived in southeastern Michigan since 2014 when he joined the staff of the World Socialist Web Site (WSWS) after completing his master’s degree in history at the University of Wisconsin, Milwaukee. He has written extensively on US social conditions, working-class struggles and the assault on democratic rights. He recently reported for the WSWS on the teachers strikes in West Virginia and Oklahoma. The US midterm elections are being held under conditions of unprecedented political crisis in the United States. The Trump administration has launched a fascistic attack on immigrant workers, including mass deportations, the ripping of children from their families, and the setting up of concentration camps for detainees. The attack on immigrants is the spearhead for an all-out assault on democratic rights, as the ruling class implements a policy of world war and social counter-revolution. Amidst these conflicts between two reactionary factions of the ruling class, an altogether different conflict is emerging, between the working class and the corporate and financial elite. The first half of 2018 has seen a significant upsurge of class struggle internationally, including a series of teachers strikes in the US that have developed in opposition to the pro-corporate trade unions. These struggles are only an initial sign of what is to come. Among masses of workers and youth, there is a seething anger over historically unprecedented levels of social inequality and the destruction of public education, health care, pensions, jobs and other basic rights. There is a growing audience for socialist and revolutionary politics. The SEP is fighting to build an independent socialist political movement of the working class, connecting the fight against inequality to opposition to imperialist war, the assault on immigrants, Internet censorship and the destruction of democratic rights. It seeks to develop an understanding within the working class that its future, and the future of humanity, requires the overthrow of capitalism internationally and the establishment of a socialist society based on equality and the democratic control of production. The campaign of Niles Niemuth for Congress will bring this perspective to workers in Michigan. The 12th district is an important center for the working class, combining the Detroit suburb of Dearborn—the location of Ford’s headquarters and home to the largest Arab-American population in the country—with the working-class Downriver communities and the college town of Ann Arbor. The district includes three Ford plants that employ thousands of auto workers: Dearborn Truck, Flat Rock Assembly and Woodhaven Stamping. The 12th district also encompasses the campuses of multiple research universities and community colleges with tens of thousands of students, including the University of Michigan (Ann Arbor), the University of Michigan (Dearborn), Eastern Michigan University and Washtenaw Community College. The district’s current representative, Democrat Debbie Dingell, is a scion of the Fisher Body family and was a long-time lobbyist and then executive for General Motors. Dingell inherited the seat in 2014 from her husband John Dingell, a Democrat who represented Michigan in Congress for over 59 years. Running for reelection in a “safe” Democratic district, Dingell has already raised nearly $700,000 to fund her campaign, taking major contributions from billionaire Dan Gilbert’s Rock Holdings as well as the United Auto Workers Political Action Committee.